Jonathan Hope is quickly gaining a reputation at home and abroad as one of the most dynamic young performers of his generation. Increasingly in demand as a recitalist, Jonathan’s recital career to date has taken him throughout the UK, as well as France, Germany, Italy, the USA and Australia. Recently, he has performed solo recitals at Canterbury Cathedral, Westminster Cathedral, St. Paul’s Cathedral, Westminster Abbey and Saint-Sulpice, Paris. In July 2010, Jonathan undertook a recital tour of Sydney and Melbourne, Australia. 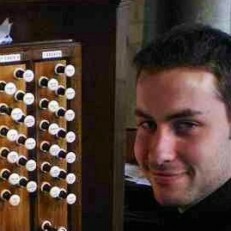 Jonathan is currently Assistant Director of Music at Gloucester Cathedral, having previously held organ scholarships at Southwark and Winchester Cathedrals. Jonathan improvises to the Lon Chaney's classic silent film "The Phantom of the Opera"